As an alternative we offer the purified H3K79me3 polyclonal antibody (C15410068). To determine the titer of the antibody, an ELISA was performed using a serial dilution of Diagenode antibody directed against H3K79me3 (Cat. No. CS-068-100) in antigen coated wells. The antigen used was a peptide containing the histone modification of interest. By plotting the absorbance against the antibody dilution (Figure 1), the titer of the antibody was estimated to be 1:70,000. 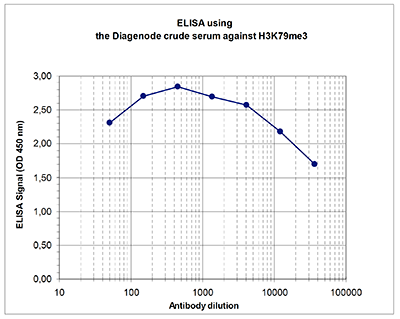 A Dot Blot analysis was performed to test the cross reactivity of the Diagenode antibody against H3K79me3 (Cat. No. CS-068-100) with peptides containing other modifications of histone H3. These include mono- and dimethylation of the same lysine and mono-, di- and trimethylation of lysine 9, 27 and 36. One hundred to 0.2 pmol of the peptides were spotted on a membrane. The antibody was used at a dilution of 1:50,000. Figure 2 shows a high specificity of the antibody for the modification of interest. 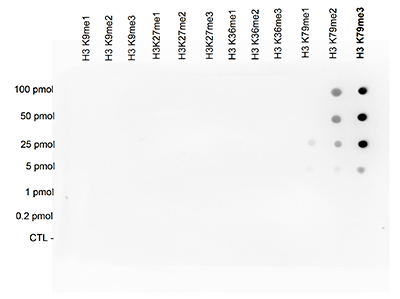 Western blot was performed on histone extracts from HeLa cells (15 μg) with the Diagenode antibody against H3K79me3 (Cat. No. CS-068-100), diluted 1:500 in TBS-Tween containing 5% skimmed milk. The molecular weight marker (Bio-Rad, broad range biotinylated SDS-PAGE standard) is shown on the left, the location of the protein of interest is indicated on the right. Mouse fibroblasts (NIH3T3 cells) were stained with the Diagenode antibody against H3K79me3 (Cat. No. CS- 068-100) and with DAPI. Cells were formaldehyde fixed, permeabilized with Triton X100 and blocked with PBS containing 2.5% BSA. Figure 4A: cells were immunofluorescently labeled with the H3K79me3 antibody (diluted 1:200 and incubated for 1 hour at room temperature) followed by goat anti-rabbit antibody conjugated to FITC. Figure 1B: staining of the nuclei with DAPI, which specifically labels DNA. Both antibody and DAPI staining are restricted to the nucleus. 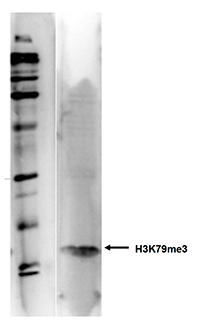 Diagenode strongly recommends using this:	H3K79me3 polyclonal antibody - Classic (Diagenode Cat# C15310068 Lot# A86-001). Click here to copy to clipboard.